In 2008, AAA recommended Avenue Body Shop to fix my back bumper after I was rear-ended. I was happy with their work and service. Last week someone hit the same bumper while my car was parked in a parking lot. I went back to Avenue, expecting to pay the $250 deductible to have the bumper fixed again, but the person at Avenue said that they would fix it under warantee. I didn’t have to pay the deductible. Avenue offered me a free rental car, but since they would have the car only overnight, I declined that offer. Avenue gave me a ride to work after I dropped my car off to be fixed and a ride from work back to Avenue to pick my car up the next day. The bumper looks great. What more could I ask? This place is fabulous. Tony really goes above and beyond to make sure the customer is satisfied. I had a check engine light on which Avenue could not get the exact code due to dealer restrictions instead of trouble shooting and repairing what it might be he suggested going to the dealer getting the 100% diagnosis and calling him after. Tony then helped me through the dealer quote and “other problems” they suggested to be fixed. This is not the first time Avenue Auto has come through for me I highly recommend this place for all your repairs. I will recommened Avenue Auto to ALL of my friends and patients!!! For the past several months I have been hesitant to take my car into a shop. I had been dealing with a shop in Mt View for the past decade but unfortunately they out pf are business. Well, worry no, I have found my new shop. Tony took care of me from the moment I called to schedule an appointment. Tony really takes pride in his prefession, he likes to educate his customers. I am very happy with their work and service. I dropped off my car, Tony had everything ready and they even drove to work. That’s a first for me!! The job was done quicky and you can’t beat the price. This is a fantastic establishment. My car broke down around Redwood City after my battery light came on. I called AAA, Jeff from Avenue Auto Service, showed up, although a little late. He was kind, and when my battery didn’t recharge, he suggested that my alternator needed. He suggested that his own auto shop, Avenue Auto Service would be able to fix the issue at a decent price. I was skeptical but agreed. Upon arrival in Jeff’s tow truck, I was treated by Tony a consumate professional, who made it clear what price range I was looking at. They gave me a ride back home. Upon diagnosis, Tony told me that he had found a very cheap replacement alternator, but that it would take a couple more hours to for it to get there. He warned me that my battery might need a change, I gave him permission to change it, he insisted that it was important for him to test my existing battery before replacing it. He did, and decided against his own financial interest that I didn’t need a battery change. The alternator was changed ahead of his estimated time, at the very very low end of the price bracket I had researched on the internet. These folks are remarkably honest, professional and effective. I sure hope next time my car breaks down, I hope it is in San Carlos so I can entrust my car to those guys again. I was recently in a car accident and had my car towed to Avenue Auto for repair. They took care of everything, from the repairs to the insurance company to the adjustors and anything else that came up. These guys know what they’re doing taking the stress off the customer. My car came back looking and running like new. I would not take my car anywhere else! They still put the customer first…. and you can’t say that about many places these days. Have been a customer at avenue for years now. Am always pleased with their services and work. Tony is awesome and remembers me by name. Had to write a review because I am so pleased to know of this place and everyone I refer here raves as well. Their pricing is better than the other shops and you can rest assured they wont pull any sneaky crap to make more money. Love this place! Highly reccomend it! I wanted to write about a great experience that I had with Avenue Auto. Unfortunately i broke down on hwy 280 close to San Carlos/Redwood city. I called AAA and they sent Ben from Avenue Auto. He was upbeat and efficient (compared to some other towing companies that I worked with). He even suggested some rental car agencies to call while he was hooking my car up to be towed. I couldn’t get a rental car in the area, since it was after 6pm. They proceeded to call a cab and I was on my way. Great Job guys…. We have been taking our cars to Avenue Auto for over 30 years – we don’t go anywhere else. Work has ranged from routine service to major body work. They are honest, helpful and prompt. In fact, they went out of their way to work with our daughter who had limited funds. And they don’t charge an arm and a leg just to diagnose the problem. Great service AND great workmanship!! Good bodyshops are so hard to find. I’ve had more than one car worked on here and could not be happier. Thanks Doug!! Had to get a tow my car which was in an accident not to long ago (hit in the back) and I needed to have it tow from one shop to another becuase the compay it was at said they can’t find that parts (1996 Chevy Impala)… anyway my car would not start and I dropped it off at the shop working fine nothing was wrong with my engine so I was fighting with the shop it was at and Avenue Towing was waiting to Tow it (Ben) was such a great help he was there and waited the hole time and helped out and didn’t leave untill it started and he started it!!! GREAT HONEST GUY!!! Will USE AGAIN!!!! THANK YOU AVENUE!! 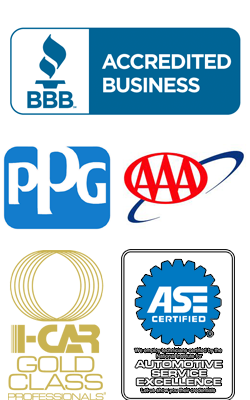 I had a great experience with Avenue Auto Service! My car needed some quick body work and not only did they do a fantastic job, but they had the repair done by the end of the week. They arrange the rental car for you too. I was kept informed along the way, and they went the extra mile. Doug was so helpful if you get a chance to work with him.